I followed the rules....I don't get to say that much but I have had a full day of rule following. For starters my running partner told me not to run today, not to workout at all today, do NOTHING! It was not what I wanted to do but it was actually quite nice. I had a full day at work today. I started off really early this morning making cookies for an Open House. I was up at 7:30 making cookies and didn't eat them but I did put two raw portions of dough back so I could have a cookie tonight. But I did good on breakfast, I ate my bowl of cereal and fruit smoothie. I am just loving this fruit smoothie in the morning....and its so easy to make. Put a bunch of fruit in a blender, some ice and orange juice, and I have a drink for breakfast that last till about noon. I put mine in an insulated coffee cup so it doesn't melt and sip all morning. Well, I had another appointment this morning and actually missed the entire Open House that I baked the cookies for, but I think it kept me from eating so many sweets. When they just sit on a table so pretty and are all cut up in bite size pieces I think they don't have any calories and end up overdoing it. And for once I got home before 6pm, its amazing what time you can get home when you skip the gym. I made a wonderfully healthy dinner: panini sandwich with fruits and veggies. Then I took my two balls of cookie dough and made two hot fresh chocolate chip cookies and poured a glass of milk. I don't know if it was the anticipation of the cookies or if they were really that good but it was a wonderful treat! Then I followed more rules, given to me by my local physical therapist, and Ice Massage. Oh yes, I spend plenty of time icing sore joints but this was new for me. 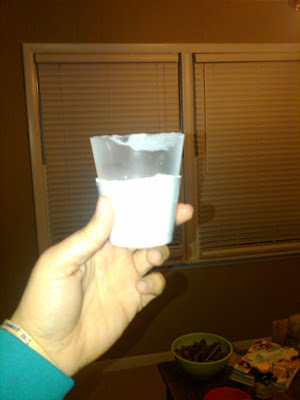 Fill up a cup, plastic or Styrofoam, with water and freeze it. 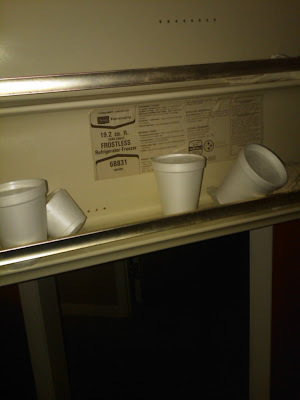 If you use Styrofoam cups they will explode on the bottom! 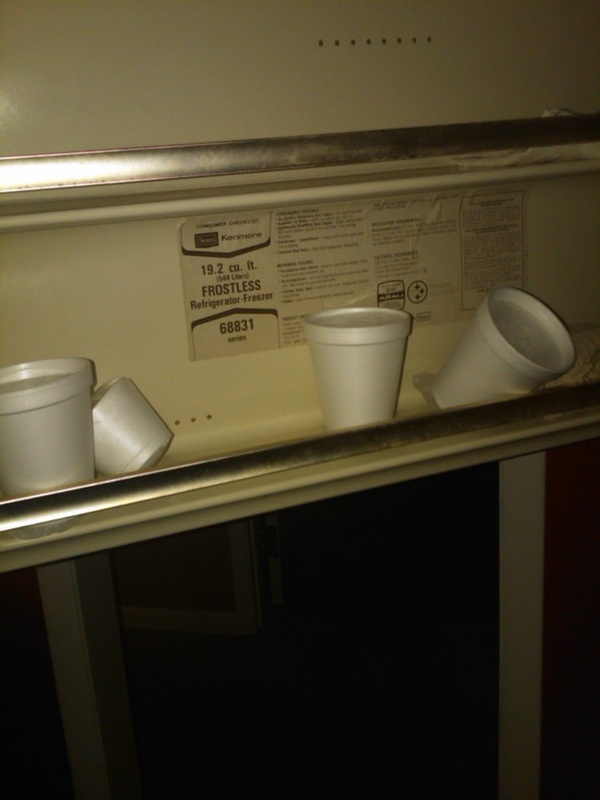 Make sure you can cut the top off of this cup. Take it out of the freezer and expose about an inch of ice. Then start rubbing it directly on the area that hurts. By the way, the braclet (rubber band) says, "You must do the things you think you cannot do!" It actually feels pretty good, it is cold but a nice pain relief directly on the spot that hurts and it only took a few minutes for the ice to melt down to the cup. I decided to do this tonight because I spent the entire day on my feet and as the day wore on my knee started buckling on me so I thought it could do some good before the long run tomorrow. Looking forward to my long run tomorrow. Hoping and praying that it goes great and that I make my distance. Ill let you know how it goes!